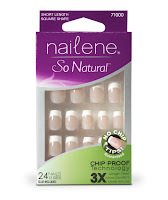 Nailene Girls: Nailene's "So Natural" Nails Coupon! Nailene knows that everyone has a unique set of beautiful nails. We've innovatively created So Natural nails that are designed to flex-to-fit. Whether your nails are high-arched or flat, these nails will comfortably form to your individual nail shape. It's like a custom-fit nail! So Natural also comes with Chip Proof technology that enables you to wear your nails longer. If you'd love to try out our So Natural nails, print out our coupon found online. So Natural is available at your local retailers.